Infused with the label’s signature dark romanticism and urban styling, French fashion house Givenchy was originally founded in 1952 by acclaimed couturier Hubert de Givenchy. Under the creative direction of Clare Waight Keller, the cult label continues to celebrate the label’s house codes through sharp tailoring and expert craftsmanship. 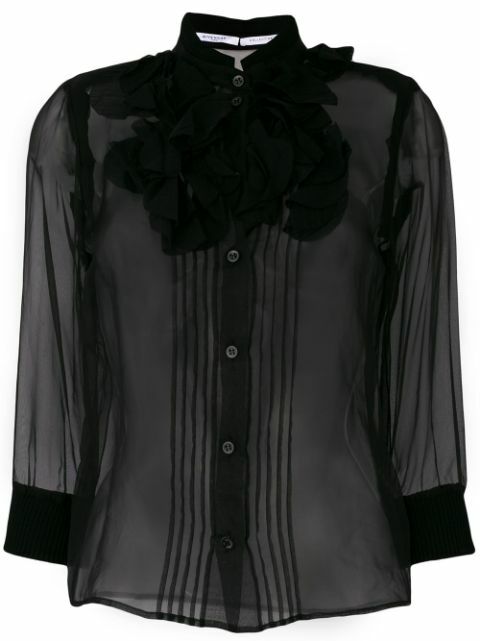 This black silk sheer blouse from Givenchy features a stand up collar, a ruffle trimming, pleated details and ribbed cuffs.